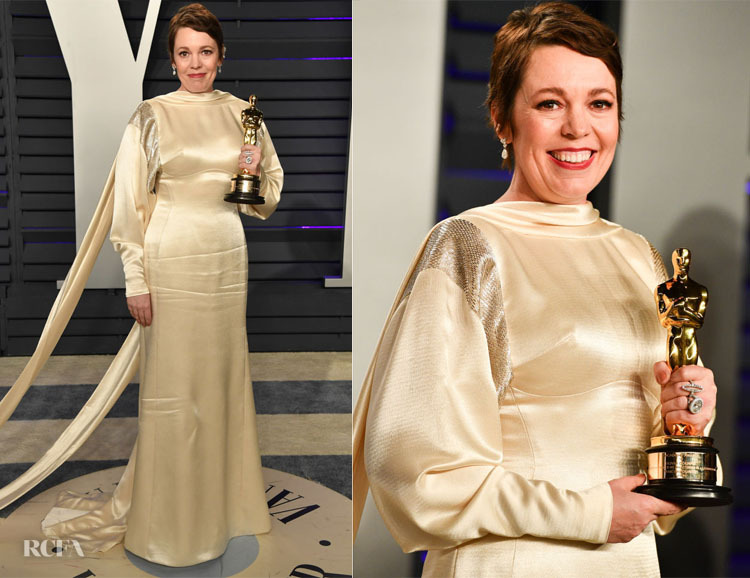 Olivia Colman celebrated her Lead Actress win for ‘The Favourite’ at the 2019 Vanity Fair Oscar Party on Sunday (February 24). It might have been her night in terms of trophies, but I wish I could say the same thing for fashion. Her Prada dress at the 2019 Oscars struck the wrong note with many and I fear this custom Stella McCartney gown will also be a difficult sell. Everything about the champagne-hued style will be lost to the obvious creases. When one looks beyond the wrinkles, there’s confusion between the flowing shoulders and the teeny-tiny train. She deserved better for her special moment.